"I've got the sinking sensation again…" With the Toronto Film Festival now underway, a teaser trailer has debuted for Buster's Mal Heart, one of the many indie films showing there over the next week and a half. Directed by Sarah Adina Smith, and starring Rami Malek as a "troubled man on the run from fate", this short teaser doesn't reveal much but it definitely is a very intriguing first look. The cast includes DJ Qualls, Kate Lyn Sheil, Lin Shaye, Toby Huss, Mark Kelly and Teresa Yenque. Malek (who is breaking out thanks to "Mr. Robot" though we love him in The Master, Ain't Them Bodies Saints and Short Term 12) looks great with a full beard and long hair in this, and I'm curious to see how it works into the story. Enjoy. 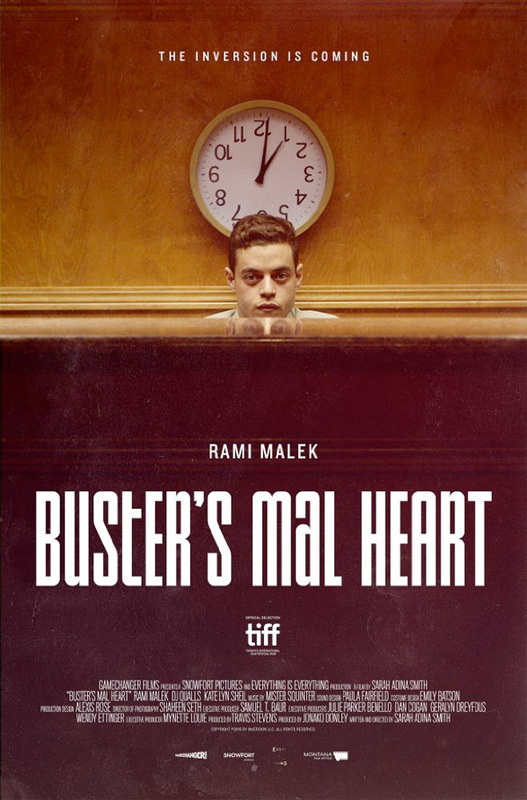 Rami Malek stars in Buster's Mal Heart as Jonah, a troubled man on the run from fate. Malek exposes the depths of Jonah's soul in this smart thriller, peppered with dark humor and laden with interlocking mystery. From the bold cinematic mind of Sarah Adina Smith, Buster's Mal Heart is a visceral mind bender that will provoke discussion long after it turns your world upside down. Buster's Mal Heart is both written and directed by young American filmmaker Sarah Adina Smith, making her second feature after The Midnight Swim and a few shorts previously. The film is premiering at the Toronto Film Festival this week. It was produced by Snowfort Pictures and Gamechanger Films, and is still looking for US distribution. A year ago I'm playing a horror video game with some big eyed nobody. Flash forward and Mr Robot is one of the best shows on TV thanks in no small part to Rami. I liked him since A NIGHT IN THE MUSEUM. // Ooo...that sounded hipster...my B.
Malek's acting style is so weird and cool. I think he would kill it in a comedic role. Oh God, Malek is the new Eissenberg for me. I won't watch anything he's in. Malek has been outstanding since The Pacific. Count me in.